This costume was made with love by Grandma! 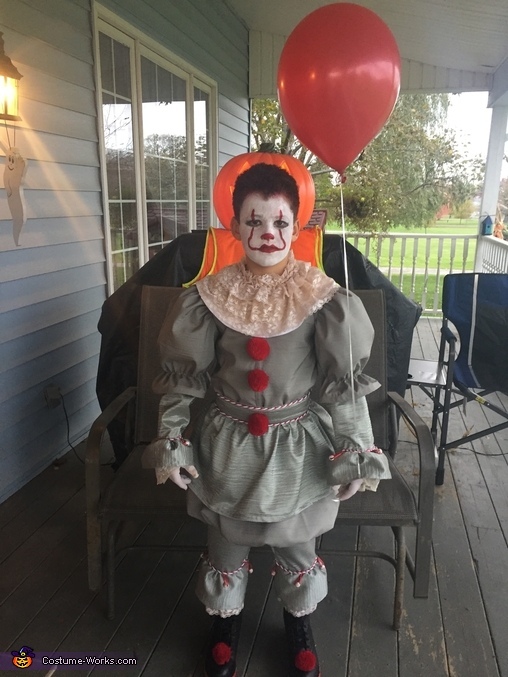 My son Aiden is 9years old and loves horror films, when the movie It came out, he asked his Grandma if she would make him the costume for Halloween. He printed out a picture and off we went to Grandmas to get measured, she bought all the material from Lens Mill store and without a pattern she worked away and made him his costume. It took her a week to get it perfect. He wouldn't wear the wig we bought, but we put some red colour in his hair. I did his make up with white cream paint and red lipstick for his eyes I just used my own black eye liner. For his foot wear we just bought cheap black boots and we glued the red puffs on them. Everyone loved his costume on Halloween night, it is a very impressive well made costume. Thanks Grandma!